Anemia is a low level of healthy red blood cells (RBCs). RBCs carry oxygen from the lungs to the rest of the body. 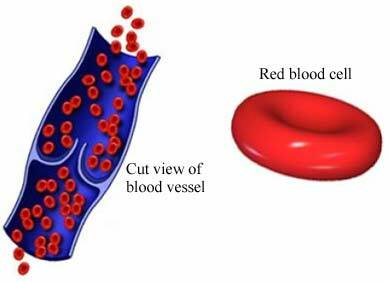 When red blood cells are low, the body does not get enough oxygen. You may be told to make changes to your diet. The diet may include foods rich in iron, vitamin C, vitamin B12, and folate. Vitamins or iron supplements may be added. A blood transfusion delivers blood cells from healthy donor blood. This procedure places healthy bone marrow or stem cells in the body. The goal is for the new tissue to produce healthy blood cells. This procedure carries risk. It is only done in severe cases of anemia. Critical bleeding may be treated with surgery. In cases of very high RBC destruction, your spleen may need to be surgically removed. Eat a diet rich in iron and vitamins. Take iron or vitamin supplements, as advised by your doctor. Treat underlying causes of anemia. Report signs and symptoms, especially chronic fatigue, to your doctor. Anemia—differential diagnosis. EBSCO DynaMed Plus website. Available at: http://www.dynamed.com/topics/dmp~AN~T240897/Anemia-differential-diagnosis . Updated January 21, 2016. Accessed September 29, 2017. Explore anemia. National Heart, Lung, and Blood Institute website. Available at: https://www.nhlbi.nih.gov/health/health-topics/topics/anemia. Updated May 18, 2012. Accessed September 29, 2017. Guralnik JM, Eisenstaedt RS, Ferrucci L, Klein HG, Woodman RC. Prevalence of anemia in persons 65 years and older in the United States: evidence for a high rate of unexplained anemia. Blood. 2004;104(8):2263-2268. Nissenson AR, Goodnough LT, Dubois RW. Anemia: not just an innocent bystander? Arch Intern Med. 2003;163(12):1400-1404.